Now on Kickstarter: Boss Monster for iOS and Android! Hi, Boss Monsters! It's been a while! 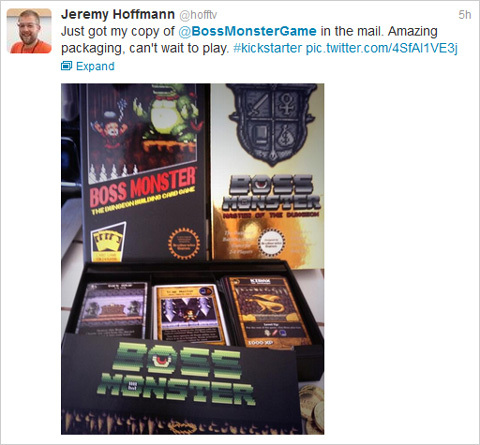 Ever since the Kickstarter for Boss Monster, we've been on an incredible journey. Thanks to your support, Boss Monster has now reached tens of thousands of people around the world. For a couple of brothers whose ambitions were to reach a few hundred, it's been the time of our lives. Now we're back, because we've had something brewing that we think you ought to hear about: the Boss Monster app. We think the prototype is already looking great, so we can't see what Plain Concepts will do with more months of development time! The campaign has some great rewards, including all-new cards we've designed specifically for the digital game. But because we know everyone loves more physical cards, we've created the PAPER AND PIXELS pledge level to unlock printed versions of those all-new cards. Supporting digital Boss Monster is also your inside track to backers-only updates on Boss Monster 2, which is now in development! We've just launched the Kickstarter, and already we're seeing some phenomenal support. But paying for a top-notch software developer is a lot more expensive than supporting a couple of guys selling games out of their garage. Our goal is ambitious and we need all the help we can get. So please check out the campaign, spread the word, and do all that stuff you did to make the first Boss Monster such a hit. Thanks again for everything, and we hope to see you over at the new campaign! This was a big week for Boss Monster. Working with our fulfillment partners, we made a huge amount of progress on shipping. As of today, we've shipped most of our domestic units and we've completed pre-shipment processing for international orders. By Monday, we'll have shipped all domestic units and the first batch of international units will be in the mail. A quick tweet or post like this might not seem like a big deal, but it means a ton to us. Every new person who tries Boss Monster gets us one step closer to the new expansions and new games we want to make. Besides, this is the perfect excuse to brag about your sweet new game! For your starting hand, draw 5 Room cards and 2 Spell cards. Then discard two cards. This gives you the chance to start tuning your dungeon from the beginning. During the pre-game Set Up, each player builds one Room. During every subsequent turn of the game, players have the option to build a Room before Heroes enter dungeons. That means the first time a Hero shows up, you'll have had the chance to build two Rooms. Whenever you build a Room, place it face-down. Once everyone has picked a spot, simultaneously reveal your Rooms. This keeps your opponents from reacting to you "bid" for a particular treasure/hero type. The maximum dungeon size is five visible Rooms (not counting your Boss card). Spells can be played in the Build and/or Adventure phase, as specified by the icon on the card. Room abilities can be played during either phase. When resolving a Spell or Ability, the "active player" always gets priority. During the Build phase, the "active player" is the one who's currently deciding where to place a face-down room. During the Adventure phase, it's the player who currently has a Hero entering his dungeon. The first time you play, we find it's nice to start with a 2-player game to get a feel for the rules and the dynamics. Then it's on to the fun of 3- and 4-player games! Spells can be a scarce resource, so look for opportunities to draw them. Err on the side of keeping both Spell cards in your starting hand, and pick up Mage rooms that let you draw Spell cards. Don't be shy about luring Heroes, even early in the game. The player with a couple of Wounds in the early game is often the one who ends up winning, because it means he's building an attractive dungeon. Remember: every Hero in your scorekeeping area is one not counting toward your opponent's Soul total. Draw lots of cards! As with almost any card-based game, "card advantage" is a winning strategy. Boss Monster rewards flexible tactics more than rigid long-term plans, and your flexibility depends entirely on how many choices you have in your hand. Keep an eye on Spells and Rooms with "Draw a card" effects, and use them as often as you can! As we ecstatically watch Boss Monster backers beginning to receive the game, we're reminded that it's you who made this possible. At a time when a lot of the top Kickstarter projects are coming from creators who have an existing fan base, we still feel like our campaign is one of the best examples of backers supporting a couple of totally unknown designers. Thanks for taking that risk, and we hope you'll feel it was worth it when you see your copy of the game!